Founded in 1232, the Klementinum in Prague is the largest and most historic complex of buildings in the Old Town. It covers an area of over two hectares close to the Vltava River, near Charles Bridge. The Klementinum (Clementinum) has undergone a rich architectural evolution. Since the Middle Ages many of Europe's great astronomers, scientists, philosophers and musicians have studied and worked here, influencing the development of its wonderful array of buildings. The arrival of the Jesuits in 1556 marked the beginning of the main construction period. From 1578 to 1726 a former Dominican Convent was replaced by a complex of baroque churches and college buildings, with famous architects and artists involved in their design and decoration. -Mirror Chapel: a truly beautiful and unique chapel built in 1724, with extensive frescos and carvings. Houses two 18th century organs, one played by Wolfgang Amadeus Mozart on his visits to the Klementinum. -Baroque Library: home of the Czech National Library, with 20,000 books from the early 17th century onwards, and historically important globes. Decorated with magnificent ceiling frescoes, the room remains unaltered since the 18th century. -Astronomical Tower: 172 steps lead to the top of the tower for 360° views over Prague. A lift operates only part of the way, and the steps are steep, so not for visitors with walking difficulties. -Meridian Hall: situated on the 2nd floor of the tower. Light streaming into the hall from the window determines high noon. Astronomical instruments on display measure the distances of celestial objects. -St. Salvator Church and St. Clement's Cathedral: both churches form part of the outer wall of the Klementinum, and feature some of the most important Baroque architecture in Prague. Guided tours of the Klementinum include the Baroque Library, Astronomical Tower and Meridian Hall. Tours run every 30 minutes from 10:00-18:00, and last 45 minutes. (Mirror Chapel is not included. It is reserved exclusively for concerts - see below). No need to pre-book the tour, tickets are available on the day. Price: 300 CZK. 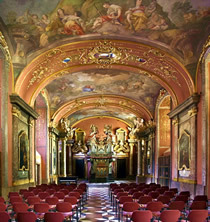 Classical concerts are held in the historic Mirror Chapel. The 18th century organs are played during performances. The concerts are popular and tickets are limited, so advance booking is required.